It’s time for a new challenge at Classy Cards ‘n Such: Let’s make it Pink. October, as you know, is Breast Cancer Awareness month and this challenge is an opportunity to send our love, encouragement and words of hope to all of those ladies out there who have struggled or are struggling with this terrible disease today. I think now a days each of us knows someone who has battled breast cancer. Whether those loved ones lost or won their fight the most important thing is justly that, that they have fought for their lives. Please my friends, do your check-ups regularly because an early diagnose can certainly save your life! I lost one very dear “adoptive” aunt to breast cancer. She decided to hide the illness for years, even knowing one of her sons was a doctor (miss her). And as we speak an aunt in Brazil is battling cancer, her son too is a doctor (my cousin) and he is taking the best care of her. I have hope that she will make it… I pray she does! I want to dedicate this card to her and to all those who need the inspiration and motivation. My card for today is adorably pink. It’s a mixed media card. 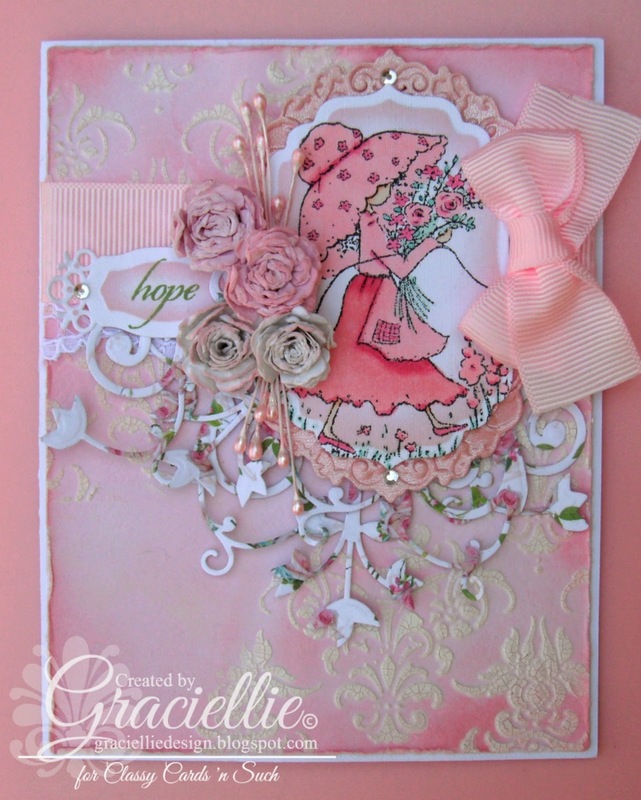 The background was die cut with A2 Matting Basics A from soft pink cardstock. I then stenciled it with Crackle Embossing Paste, using the Large Damask stencil, both from Dreamweaver. Once the paste dried, I applied two tones of pink Distress inks (Spun Sugar and Worn Lipstick) with a Mini Ink Blending Tool irregularly and also sprayed some water on it. Next I distressed the edges of the layer manually. 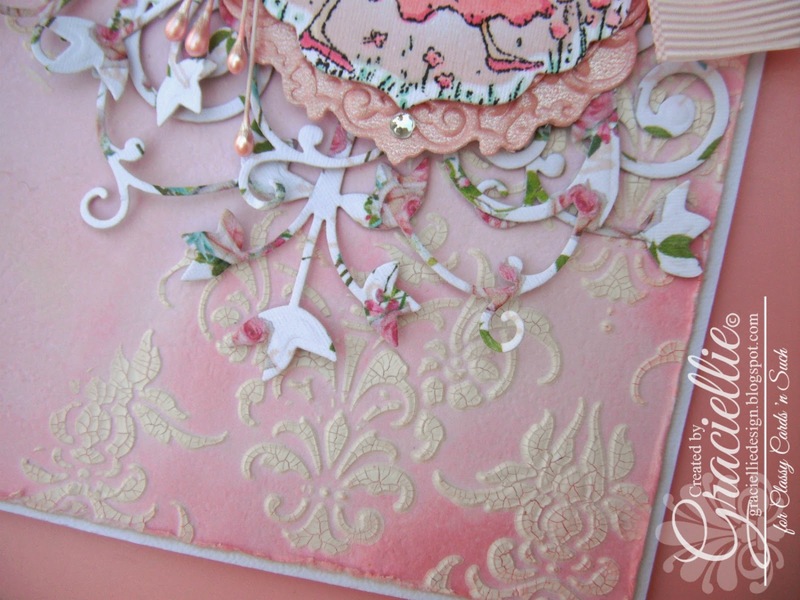 To embellish the mixed media layer, I added a piece of lace followed by a piece of pink ribbon across the card horizontally, on the top third of the layer. Then I die cut three Fantastic Flourish Three, from a digital paper I designed and that I printed on White Pearl Linen, but I cut the outer loops to make them look softer and to be able to layer them together seamlessly. A very important part of this card is the sweet little image I stamped with Wild Rose Studio’s In the Meadow. I stamped it on White Pearl Linen with Memento ink in Tuxedo Black, and colored it with Spectrum Noir markers in PP3, PP5, FS2, FS3, GB8, BT2 and BT4. Next I die cut it using Spellbinders Classic Labels Four, and stenciled it with Distress ink in Spun Sugar. I mounted the label on a coordinating Imperial Gold Labels Four I die cut from Stardream Rose Quartz metallic cardstock. I adhered the three altered flourishes behind the framed image and mounted it all on top of the ribbon and lace, to the right. I made some small roses using Bitty Blossoms medium die. I added those to the left side of the framed image together with some pink pearl stamens. I also attached a little tag underneath the roses, die cut with Fancy Label Tags One, on which I stamped the word hope, from Flourishes Zinnia set, using with Memento ink in Bamboo Leaves. I stenciled the label tag with Distress ink in Spun Sugar too. 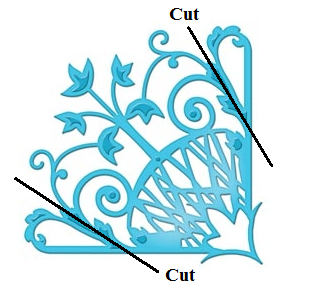 I finished the design with one pretty bow on the right side of the image and some Baby Rhinestones – Silver. And finally I attached the very embellished mixed media layer to a white card base. I hope you enjoyed seeing my card and I also hope that you feel inspired to join our challenge this week with your Think Pink creation! As always there will be a prize from the store for one lucky winner if we reach more than seven entries, so invite your friends to play along! Remember that all the products used to make my cards are linked above, but you can also visit Classy Cards ‘n Such store directly (here). A plenty of new crafty things have been added recently! If you do purchase don’t forget to use my code Gracie-10 during checkout, to get 10% off your order! Thanks so very much Marlene! 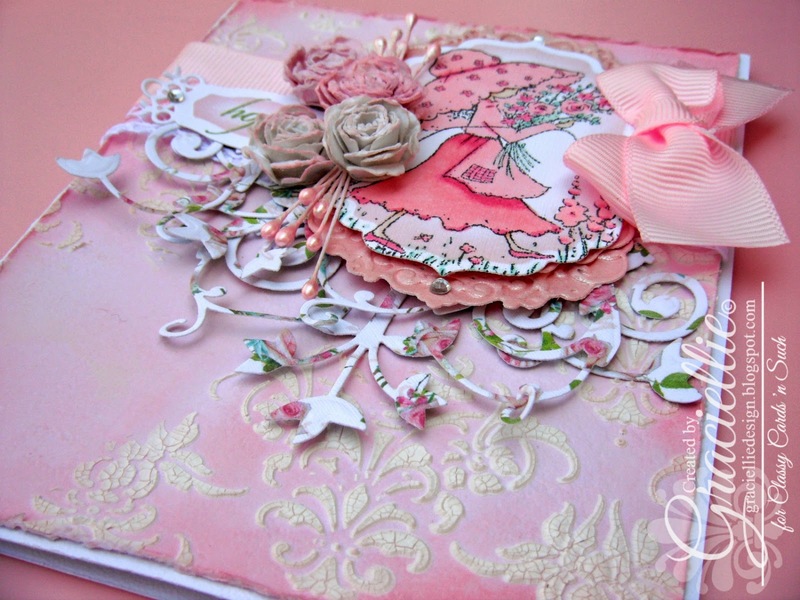 Such a pretty card, I love all the added embellishments! Thanks for playing at The Crafting Cafe in our Think Pink challenge this month! 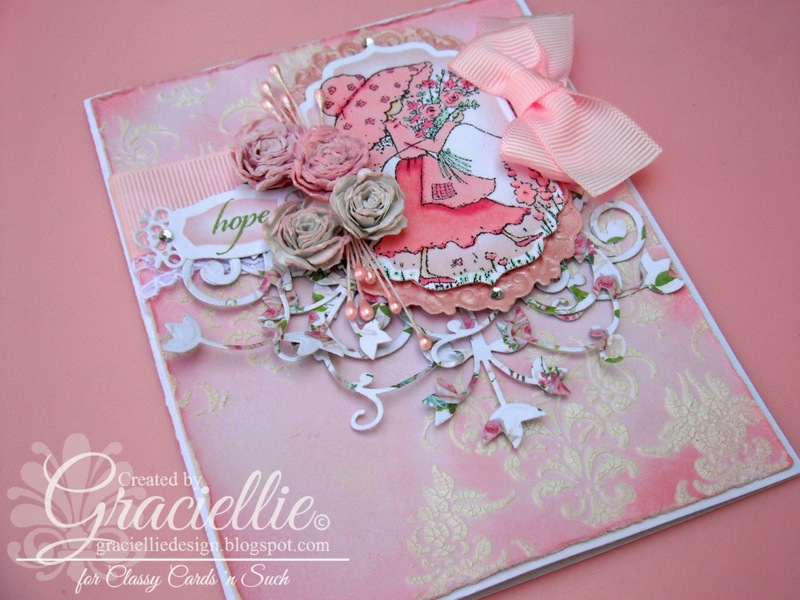 Gracielle this is just deliciously pink! I'm sending healing hugs your way also as you have loved ones lost and battling this awful disease. Thank you so much for sharing such a part of you with our challenge! Thank you Lee! I appreciate it. This is just precious! Very feminine. That embossing is beautiful! I say beautiful all around on this. 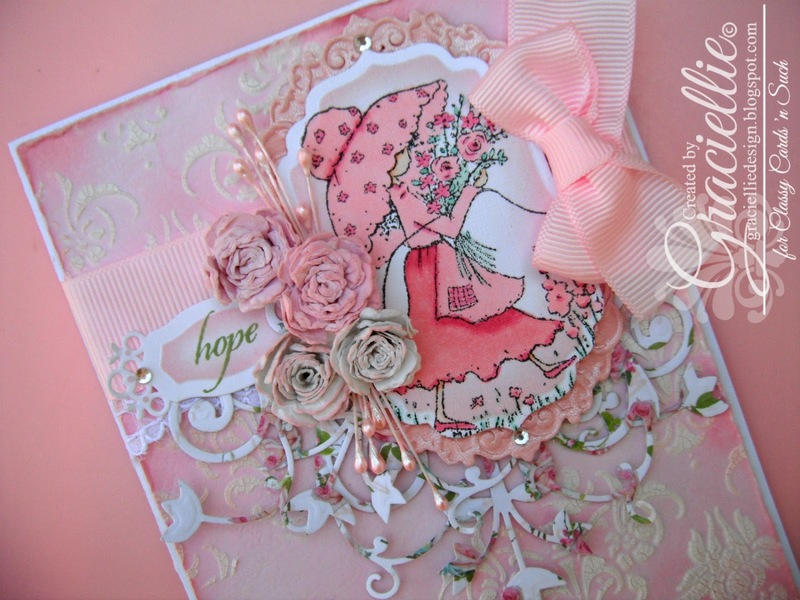 This card is so lovely, soft and sweet! Thanks for joining the Craft-Dee BowZ challenge for October.